The goal of our Hand Fellowship Program is to train the Fellow in all aspects of hand surgery. The applicant must have completed an approved residency in orthopaedic or plastic surgery. The purpose is to help the Fellow develop an understanding of surgical and medical management of musculoskeletal problems of the entire upper extremity. The program consists of a didactic lecture series, as well as clinical evaluations and surgical experience in the treatment of hand and upper extremity problems. The program is structured so that the Fellow works closely with one or two attendings at a time. There are four full-time hand surgeons within the department and three physicians in private practice, all of whom are involved in the educational process. The Fellow will also be able to participate in clinical and basic science research projects at the Institute of Human Performance. The program provides a mix of basic hand surgery and complex hand surgery conditions. While the program has an emphasis on hand surgery, one attending has completed an additional fellowship in elbow/shoulder surgery. The attending surgeons come from both orthopaedic and plastic surgical backgrounds. As a result, there is an excellent balance of both bone and soft-tissue problems about the hand/wrist, with a generous free-tissue transfer/microsurgery experience. This fellowship is ACGME accredited and participates in the match program. Our fellowship has a long tradition of successfully training hand and upper extremity surgeons. It was founded in 1990 by Dr’s. John Mosher, Andrew Palmer and Walter Short. Each of these surgeons were highly respected academic hand surgeons and the latter two were highly published leading experts in wrist ligamentous anatomy and biomechanics. Over the first decade since the fellowship’s inception, Dr’s. Jon Loftus and Brian Harley joined the division and continued on the tradition of clinical and research excellence while bringing more expertise and case volume in both soft tissue reconstruction, trauma reconstruction and congenital hand surgery. In the second decade, Dr. Kevin Setter joined the fellowship program as Dr’s Palmer and Mosher retired and expanded the fellowship to include clinical expertise in the entire upper extremity including shoulder and elbow. Dr. Schreck has joined the program in its third decade. The fellowship is principally a clinical fellowship with some limited research and teaching responsibilities. Educational activities include hands-on direct experiences in the clinical and surgical settings – both inpatient and outpatient. These experiences are designed to develop the physician's knowledge of non-operative and surgical techniques for treating diseases of the entire upper extremity. It is our firm belief that graduated clinical responsibility is important to the development of a hand surgeon. During a typical week three to four days are spent in the operating room with at least one and a half days spent in office hours. We feel that the office based component of the fellowship is important to the development of outpatient care as well as to provide the fellow with an environment to learn surgical indications. Enclosed within this space are: the offices of the attending hand staff, outpatient clinics of the Orthopedic Department, radiography with an up-to-date MRI imaging facility, a hand therapy office, an outpatient surgery facility where 75% of the surgical cases are performed, and a pain management center for performing therapeutic and diagnostic block. Inpatient surgery experiences as well as major traumatic conditions and replantation occur predominantly at the SUNY Upstate Medical University including the Community hospital campus. Upstate is a tertiary care level 1 trauma center with a pediatric hospital. This institution is capable of treating virtually all upper extremity and soft tissue reconstruction pathologies in adults and children including traumatic, degenerative and congenital pathology. 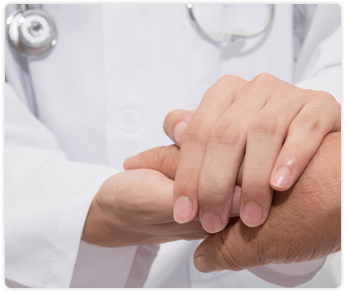 The hand surgery service provides primary hand call at this facility. The Community hospital campus is utilized for short stay inpatient upper extremity procedures such as elbow and shoulder arthroplasty. Crouse Hospital is a private hospital that is connected to Upstate by a bridge and is also covered by the hand surgery service for consultations and emergency care and some elective surgery. Thursday Morning Core Curriculum Conference: The hand surgery service hosts a weekly didactic session that is open to the entire Orthopaedic residency. These sessions occur each Thursday beginning at 7:00AM. Sessions are topic based as outlined by the core lecture. A power point lecture concerning the topic is given. These lectures are topical presentations that have been prepared by the attending staff and occasionally by the fellow. An open discussion forum occurs at the conclusion of the lecture. Monthly Morbidity and Mortality Conference: Throughout the month, all of the medical and surgical complications within the orthopedic surgery department are tracked. These are formally presented in a department wide quality assurance conference. During this conference, complications, as well as techniques for their prevention, are reviewed. Bimonthly Hand Surgery Journal Club: Every other month a journal club session will occur outside of the work place. A series of interesting and current articles will be reviewed. These sessions are voluntary sessions, but provide the fellow and residents who attend a relaxed environment to review hand surgery topics and stay up to date on the current body of hand literature.